This is a traditional looking amigurumi doll! Sort of reminds you of old Raggedly Anne dolls, doesn’t it? Except these ones are dressed up, and they’re free patterns! The dolls are around 21 – 22 centimeters tall when completed, and as you can see from the photos, there are variations available. 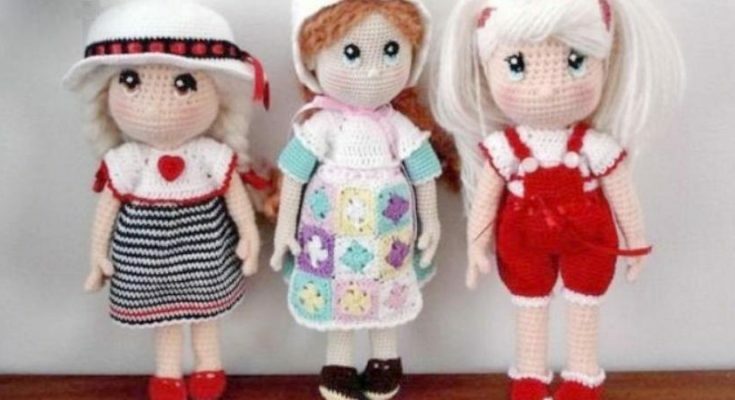 For example, some of the crochet dolls have five fingers and some have none, just hands. Have you ever wandered through an antique store, craft bazaar, or flea market and stopped in your tracks because you’ve just spotted a new art form? That’s how we felt when we saw this gorgeous crochet and embroidery piece, complete with metallic thread, pearls, and ombre shading. The results are simply stunning, and the possiblities for use are nearly endless. These would look spectacular as brooches attached to scarves, hats, or bags; used as place cards, gift tags, or a garland; or simply used to decorate a spring centerpiece. 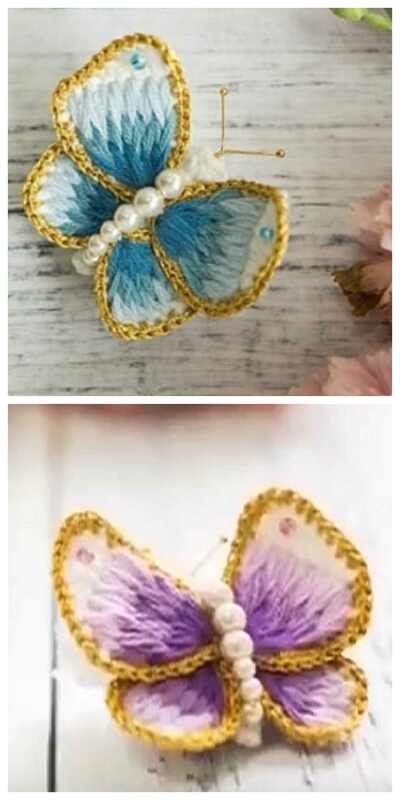 The creation of the butterfly is a process consisting of a few steps: crocheting the wings and body, embroidering the wings, and then assembling the creation. There’s plenty of help to be had with graphs, photos, and a video tutorial. You may want to consider making a larger butterfly to start with so that it’s easier to put together, and then scaling down to the size that you want depending on how you’ll be using them. Interested in creating your own collection of these beautiful butterflies? You can view the instructions and photo tutorial here, or watch the embroidery video tutorial here.